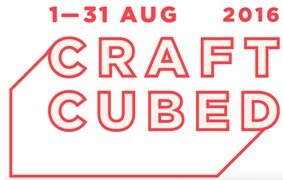 Melbourne, Australia: Now in its seventh year, Craft proudly presents the return of Craft Cubed Festival held from 1–31 August 2016. Craft Cubed is Australia’s biggest festival dedicated to showcasing contemporary excellence in the handmade and is one of Melbourne’s key cultural events that presents experimental, skilled and ideas-based craft and design. Craft Cubed Festival 2016 will mark an on-going commitment to supporting local communities through the festival’s unique satellite program and the return of a highly anticipated schedule of workshops and events. In 2016, the festival will bring together hundreds of artists, makers and thinkers for a month of exhibitions, workshops, talks, open studios, craft online and special events to promote the vibrancy and diversity of craft. Craft Cubed Festival is an annual celebration and broad event that generates engagement with the Australian craft and design sectors with innovative ideas, opportunities, connections and creative perspectives. By showcasing makers and the ideas that produce exceptional craft, the festival draws recognition and appreciation to the art of the handmade. Craft is one of Victoria’s largest and oldest arts organisation dedicated to championing aspirational making and ideas driven practice through exhibitions, public and retail programs. Craft represents more contemporary craftspeople than any other organisation in Australia, and through Craft Cubed Festival acts to bring together a vibrant and sustainable contemporary craft and design community which represents, promotes and celebrates all craft practitioners.